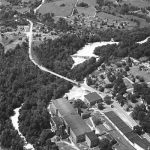 During the early decades of the nineteenth century, the southeastern corner of Rutherford County, North Carolina, the area now including the towns of Henrietta, Caroleen, and Cliffside, many settlers had already established themselves along the lower portion of the Second Broad River. 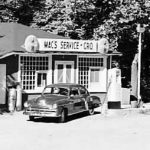 These early settlers had such names as Wall, Roach, bobbins, Burgess, Robinson, Padgett, Wagoner, Webb, Durham, Mooreland, Callahan, Wilkie, McDaniel, Smith, Blanton, Scoggins, Fowler, Robbins, Fortune, Gold, Beam, Huskey, Burge and Green to name only a few. A large number of these settlers were of the Baptist faith and had earlier allied themselves with the churches at Sandy Run, Concord, Ebenezer, and State Line. The attendance at these places of worship meant traveling several miles each way by foot or wagon over deeply rutted, muddy or dusty roads that hardly passed for cattle trails. While considering the geographical aspects of the community, it is interesting to note one physical feature of the land, which was of great importance to the settlers and to the church soon to be birthed. Oral tradition tells us that at a point on the Second Broad River, where the Henrietta dam is now located, there was an area of rocky shoals in the water, with perhaps one group or possibly even one shoal being larger and higher than the others. It is believed that the High Shoal Baptist Church obtained its name from being located near this shoal. At approximately this same spot on the Second Broad River, the early iron industry had its beginnings in this part of the country. This industry was begun by Peter Fisher in the year 1791. 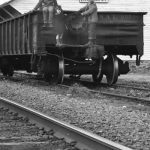 Though small and very crude in those early years, the iron industry was still very meaningful to the people of the community. Sometime after the year 1812, the iron plant was bought by Achilas Durham, a noted personality in the area. Durham’s name will soon appear as one of the early leaders in the formation of High Shoal Baptist Church. 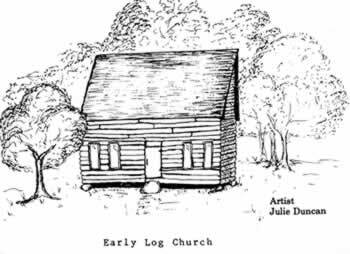 On January 29, 1825 the first step was taken toward making the dream of High Shoal becoming a church. On that date, a gentleman named Joseph Roach, for the token sum of $1.00, made a deed over to a committee of nine men, their successors or assigns “in religious and moral society,” for a tract of land containing six acres. This is the identical tract that High Shoal Baptist Church is located on today. This committee, putting their faith into action, were: John Wall, Isaac Waggoner, William Padgett, John Padgett, Daniel Webb, Achilas Durham, Edmond Padgett, Thomas Moreland, and John Callahan. It would be another six years before the church was formally organized. 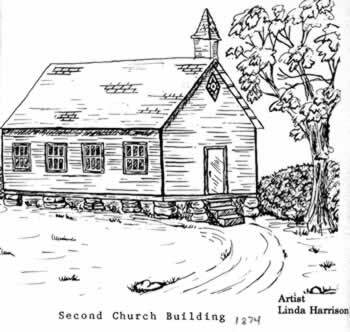 In the six years between the land grant by Joseph Roach and the actual organization of the church, a meetinghouse was built just east of the church presently in use. It was given the name High Shoal Meetinghouse. 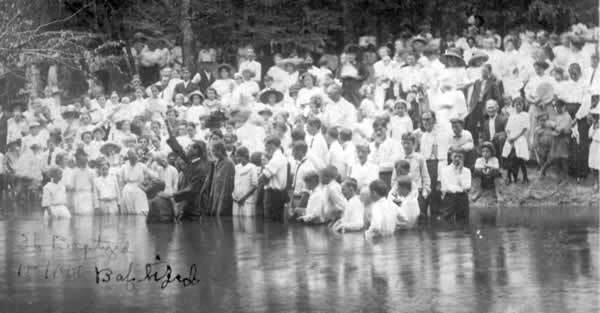 On July 27, 1831, with the assistance of Sandy Run Church, Concord Church, Head of the River Church, Buffalo Church and Ebenezer Church, the newly constituted High Shoal Baptist Church was admitted into the fellowship of the Broad River Baptist Association. The organizational structure and the “Abstracts of Principles” were certified by Elder Alfred Webb and Drury Dobbins. Those who signed on behalf of the church at High Shoal were: A.Webb, D.Dobbins, P.Fortune, J.Huskey, D.Beam, D.Gold, J.Burge, A.Wall, and S.Greene. After becoming formally organized as a Baptist church, the next step for the new congregation was to secure competent leadership. Elder John Padgett was called to be the first pastor. In March 1832, High Shoal Baptist Church licensed to preach, James M. Webb, as its first minister of the gospel. Within the next few years, Webb’s name appeared quite often in church minutes. He served the church in many capacities as well as serving as supply pastor to other churches. In September, 1834, Elder John Padgett resigned and James M. Webb was chosen as second pastor of High Shoal Baptist Church. He served as pastor from October of 1834, until the end of 1847. By the 1840’s High Shoal Baptist Church was becoming a strong and respected church in the community. It is recorded that the elders and deacons of the church were requested to go to Shiloh Church and help settle a controversy. Also, the Ebenezer Baptist Church requested help in constituting a church at Wall’s Meetinghouse ( near Ellenboro, NC.) From church minutes in the early 1840’s, the church membership had grown to approximately 62 members. In 1859 the Kings Mountain Baptist Association was rocked by the debate over dealing with the issues concerning alcohol. Because of this, eight churches withdrew from Kings Mountain Assoc. and formed the Constitutional Kings Mountain Baptist Association. These churches were Bethel, Beaver Dam, Sandy Plains, Mount Sinai, Boiling Springs, Mount Pleasant, High Shoal and Mount Parson. By 1866 the issue was resolved and these churches returned to full fellowship with the Kings Mountain Baptist Association. In 1890 High Shoal joined with other local churches to form the Sandy Run Association. The church remains a member of this association to the present. There were very few references in High Shoal church minutes regarding the War Between the States. We know that public schools were closed. Only private schools remained in operation. Many of the preachers left the churches and went to serve as chaplains or regular soldiers in the war. During this time there was a problem with soldiers deserting. Desertion was looked upon, by the church, as a sin. Back in 1847 and then again in 1856, the church had voted to build a new meetinghouse. A committee had been selected, as indicated in church minutes, and the building had begun on this new structure. In March, 1873, the church took up the question of completing the meetinghouse. Finally in June, 1874, the new church was completed. This was the second building used by the High Shoal Baptist Church. For many years, most of the baptisms for High Shoal Baptist Church were held at the big rock near the Sid Wall homeplace. The men in the church would gather on Saturday afternoon before the baptizing, fill up bags of sand, and “pond up” the creek deep enough for the next days service. Many older ladies recall that they would pin their dresses to their petticoats to keep them from rising in the water during baptism. Although little was said in the minutes about the construction of the third new church building, in May of 1891, the notes indicate that the new church house is complete. This church building is the same one that is in use today (1985). There is an interesting note in the church minutes of June 13, 1905. The trustees of High Shoal Baptist Church deeded one and one-half acres of land to the Cliffside Railroad for a right-of-way. 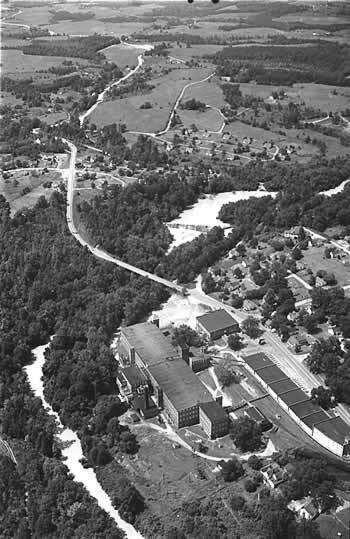 The new Cliffside Mill founded by Raleigh R. Haynes needed the track to connect his new Mill and town to the Seaboard Air Line Railroad’s tracks, just four miles away. In 1926, Mr. Charles Haynes agreed to run electric power lines out to the church. The porch, educational unit, and bell tower were added later. Not only did the church have a new building but a new attitude concerning missions. In Church Clerk minutes in 1875 a contribution of three dollars was given to missions. Some of the missionary interests in following years were Foreign Missionary Pastors, Boiling Springs High School, Wake Forest College, Southern Baptist Missions, Women’s Missionary Union, to name but a few. In 1907 they received a request to give financial assistance to the newly organized Boiling Springs High School. The church voted to raise a contribution of $250.00 in 1908 and again in 1909. In March of 1908 a special offering was given to Zeno Wall to help with his studies there. In later years Reverend Zeno Wall preached several revival services for the High Shoal Baptist Church congregation. Over the ensuing years the church continued to support this school which was eventually re-named Gardner Webb College. Over the years they have also used several of the Ministerial students as Supply Pastors. As the High Shoal Baptist Church history moved into the 1890’s, new areas of church life were introduced. One of these is the early “singing school.” Musicians would come into the church and hold a series of meetings in which different elements of music would be taught. These meetings would be held for one or two weeks with all age groups included. Many church members looked forward to these weeks of “singing school.” During the 1920’s the High Shoal Church Choir was known for it’s exceptional singing talent. Special musical programs, called “Singings,” were often held on Sunday evenings in the Sanctuary. Individuals and groups would perform, often to a full house. Mr. Jimmy Robinson was the “Chorister” during this time. 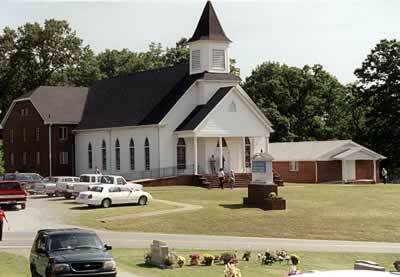 In 1902 High Shoal Baptist Church was beginning its 71 St year as an organized church. It was called upon quite often to assist fellow churches in special functions. On April 26,1903. The eldership and deacons of High Shoal Baptist Church assisted in organizing the new Cliffside Baptist Church. They also gave assistance to Floyd’s Creek Church in ordaining J.R. Matheny in 1912. High Shoal ordained her own W.E. Goode in 1905 and then assisted the young Cliffside church in ordaining Zeno Wall in 1908 and Willie Tate in 1912. Memorial Day, which has been held on the fourth Sunday in May every year since 1902, has come to be regarded as Homecoming Day to the family of believers who have been touched by High Shoal’s history and the faithful ministry it has had over the past 176 years, (at the date of this writing, 2007). Families came together to clean off the graves and to decorate with flowers or flags. Following the service there would be a time of fellowship with “Dinner on the Ground”. In 1959 a Memorial Fund was established with the understanding that the interest earned would be used for the upkeep of the cemetery. Mr. George Padgett, who was church treasurer at the time, was instrumental in establishing this fund. It is still being used for the perpetual care and upkeep of the High Shoal Cemetery. Read a copy of the actual bulletins used at the 100th Anniversary Celebration and the Memorial Day service in 1935. In 1946, under the leadership of Pastor W. F. McGinnis, a renovation project was begun. A new heating system was installed and stained glass memorial windows were placed in the sanctuary. Mrs. Mamie Lovelace was instrumental in financing the indoor baptismal pool in the sanctuary. 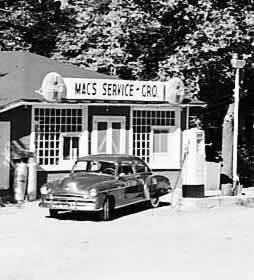 In the late 1940’s, the first indoor plumbing was installed. Water was pumped into the church from a well at the nearby Standard Oil Company plant. This was made possible through the efforts of Mr.Grover C. Haynes. In the 1950’s an educational building as well as dining room and kitchen were added. In 1969 an electric Wurlitzer organ was donated to the church by Mr.and Mrs. Ben Cole. Three months later Mrs. Fred Robinson, a former music director, was elected to serve as the church organist. In 1973, Interim Pastor, Rev. W.T. Luckadoo encouraged the church to step out in faith and prayerfully consider building a parsonage for the church. A few months later, Mr and Mrs Noyce Padgett, Jr. donated 8/10th of an acre of land as a site for the parsonage. Construction began in April of 1974 and was completed the following August. During the 22 years since 1985 when this book was written, High Shoal Baptist Church has grown in number and in their impact on the community. Faithful members began an active Youth Ministry and a Children’s Church Program. During this time, three of their young men: Steve Nanny, Kevin McAbee and Brian Ezell were ordained to the Gospel Ministry by High Shoal. Many improvements have been made to the church building as well as the grounds and the cemetery. A Fellowship Hall was built and the parking area around the church paved. More land has been purchased for future use. The journey began in 1831 with 18 charter members. In 1985 the membership was 342 and it continues to grow to this day. Innumerable lives have been touched during this Church’s pilgrimage toward higher ground. * Pastors who served after the writing of this book. The records left by the church clerks have provided valuable insight into the life and work of this body of believers.